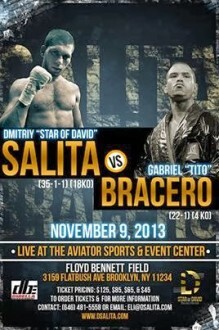 This Saturday at the Aviator Sports Complex in Brooklyn, New York, hometown welterweights Gabriel “Tito” Bracero (22-1, 4 KO’s) and Dmitriy “Star of David” Salita (35-1-1, 18 KO’s) meet in a scheduled 10 round contest being billed as the “Battle for Brooklyn”. The bout headlines a 10 fight card promoted by DiBella Entertainment, in association with Star of David Promotions. Bracero, the former NABF light welterweight champion, is on a four fight winning streak since losing a close battle to DeMarcus Corley in a fight that saw both fighters hit the canvas; Bracero was down three times himself but still came close to winning the bout. The last time he fought at the Aviator was in 2011, scoring as third round knockout over Danie van Staden. Salita hasn’t fought in over a year, his last bout a six round decision over Brandon Hoskins on the under card of Showtime’s quadruple-title bout show at the Barclays Center. He’s held a number of regional titles along the way; the New York State welterweight title being the most recent and the IBF International light welterweight and NABA light welterweight titles in years past. He worked his way to a shot at the WBA world light welterweight strap in 2009, but was dropped three times en route to a first round TKO loss to Amir Khan. Since then he’s won five straight. 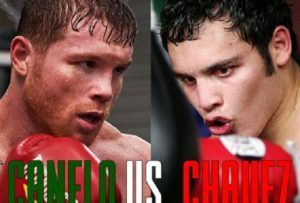 Both fighters are looking to use this bout as an opportunity to move back into world title contention. 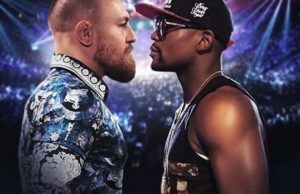 The welterweight division is loaded with big opportunities against big names for the right fighter; too many names to list, but think Timothy Bradley, Manny Pacquiao, and Adrien Broner at the top of the heap…and Wale Omotoso, Antonin Decarie, and even Shane Mosley still among the top 25 in the division with plenty of big names in between. One of the nights co-feature attractions puts rising female super bantamweight, undefeated Heather “The Heat” Hardy (6-0, 1 KO) trying for her first title, the vacant UBF International Super Bantamweight title, against Mexico’s Ana Laura Gomez (4-3) in a scheduled eight round bout. This is a significant fight for Hardy, as the Brooklyn native’s first title shot comes just over a year since hurricane Sandy took her home. The Boxing Tribune interviewed Hardy this past August; you can read the interview HERE. In the cards other eight round co-feature, light middleweight Charlie Ota (23-1-1, 16 KO’s) returns stateside to meet Mike Ruiz (17-7, 9 KO’s) in his first bout on American soil since March of 2012. Born in New York, Ota (birth name Charles Bellamy) lives and fights out of Japan, and has only fought in the U.S. once. His lone defeat came early in his career in 2007, but since then he has ran up a 17-0-1 streak and has held the Japanese light middleweight title and the OPBF light middleweight crown, which he has held over three years and defended successfully eight times; most recently in June when he stopped Koji Numata in nine rounds. Ruiz is a Long Island native who’s coming in off a title winning performance when he stopped Paul Delgado in 10 rounds to win the vacant World Boxing Federation Intercontinental light middleweight title. 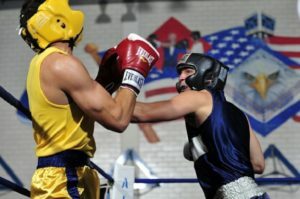 The down side is that the bout was well over a year ago, in July of 2012, and Ruiz has been inactive since. 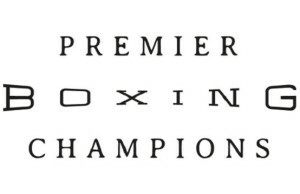 In six round action, undefeated Patrick Day (5-0, 2 KO’s) of Freeport meets Urmat Ryskeldiev (6-3, 5 KO’s), undefeated Louis Cruz (4-0, 2 KO’s) meet s Bryan Acaba (3-4, 2 KO’s), and hard hitting Long Island light heavyweight Joe Smith Jr. (12-1, 11 KO’s) faces Lamont Williams (5-2-1, 2 KO’s). In four round bouts, Ryan Martin (1-0, 1 KO) faces William Fouth (0-2), Chris Galeano (0-1) meets Jamil Gadsden (0-3), Junior Younan makes his professional debut against an opponent to be named, and five time New York Golden Gloves champion Shemuel Pagan (3-0, 1 KO) faces Jesus Javier Cintron (1-4). This special edition of Broadway Boxing will be broadcast on Go Fight Live, GFL.tv at 7 pm EST with a replay available at 5 pm the following day. Tickets can be purchased by contacting the DiBella Entertainment office at (212) 947-2577.